There are a number of possible wheatgrass side effects and almost all of these are mild and will not require any medical treatment. Some predisposed individuals may experience allergic reactions requiring immediate medical attention. One of the biggest wheatgrass benefits is detoxification and, ironically, this benefit may also cause some of the side effects experienced by individuals who start using this plant. Possible wheatgrass side effects can include an upset stomach, headaches, nausea, diarrhea, and other signs of digestive upset and indigestion. Most people who experience these symptoms are not used to consuming this plant, and these symptoms will normally subside within a short period of time. In case you experience watery diarrhea lasting several days, you may need to stop using the herb and consult your doctor in avoidance of serious loss of fluids and impending electrolyte imbalance. Individuals who are allergic to wheat should avoid this plant because an allergic reaction is far more likely and can become severe very quickly. Wheatgrass side effects from the detox process can also include a mild fever, skin eruptions, a general feeling of sickness, coughing and even respiratory congestion. As the toxins are processed from the body and pathogens die off, you may initially feel worse before feeling better. Wheatgrass powder has the same effect as the juice or the whole plant, but the detox effect is only temporary and most of the symptoms will go away fairly quickly as the body cleans out. 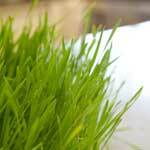 Most of the wheatgrass side effects are mild and will not require you to stop using wheatgrass altogether. As the body becomes accustomed to this plant, fewer side effects and symptoms will usually be experienced. Any unusual or serious side effects should be checked out by a physician before the use of the plant is continued. Wheatgrass shots and other forms of this plant should be taken on an empty stomach because a full stomach may cause any symptoms to become worse, and nausea is often a problem when food is present in the stomach with this plant.